Designed as an entry level mining ship, the Venture provides a platform for the beginner miner. Its ore hold and bonuses to yield make it an efficient miner that doesn't have to return to station every couple minutes. The stabilized warp core makes it easier for the ship to escape attackers, although it won't survive long against any decent attacker. It is also one of the only ships with bonuses to gas cloud harvesting. A Venture can be used with the starting skills on day one. Mining Frigate I: Improves yield by 5% per skill level. Mining I: Improves mining laser yield by 5% per skill level. Mining Upgrades I: Allows use of Mining Upgrade low slot module, boosting yield. Only need at I. Hull Upgrades I: Grants a 5% bonus to armor hit points per skill level. Shield Management I: Grants a 5% bonus to shield hit points per skill level. Shield Upgrades I: Reduces shield upgrade powergrid needs by 5% reduction, and allows better shield extenders to be attached. Jury Rigging III: Required for Shield Rigging. Shield Rigging I: Reduces shield rig drawback by 10% per skill level. Drones III: Required for Light Drone Operation. Light Drone Operation I: Allows use of light combat drones. Gas Cloud Harvesting II: Allows use of gas cloud harvesters. Despite being a frigate, the Venture is rather heavy (similar to Stealth Bombers), so aligning might take some time. If there's the possibility of a threat (e.g. war targets in systems nearby), it should fly prealigned like any mining vessel or any bigger ship. When mining in high security space (the usual activity for new miners), you are a potential target for suicide ganking. Even though Ventures are relatively cheaper (and less desirable) targets than mining barges, you may still be attacked. It is therefore ideal to orbit an asteroid nearby but not the one you are mining (once an asteroid you were orbiting becomes depleted, you will continue moving in a straight line, a big problem if you're tabbed out of EVE or AFK) and begin aligning when a threat enters your belt (e.g., a destroyer such as a Catalyst or Thrasher). By continually moving, you make it more difficult to be struck by an aggressor. If you are using an Afterburner as opposed to a Microwarpdrive, you should have this active when orbiting the asteroid and inactive when you are aligning to warp out. This tactic, along with being suitably tanked (refer to the "Newbie Miner" fit on the fitting page), makes you a less attractive target for suicide ganking (see Suicide Ganking 101). The Venture is ideal for gas cloud harvesting in both known and wormhole space. For harvesting in wormholes you don't control, use the "Ninja Gas Harvesting" fitting on the fitting page. The extra warp core stab protects you against interceptors which usually fit point and scram. A Venture can be obtained for free via completing the second mission given by Career Tutorial - Industry Agent. The built-in warp core stabilization has the same effect as two fitted Warp Core Stabilizers. As with the Deep Space Transports this means that the ship can't be kept from entering warp, unless there are several Warp Disruptors, Warp Scramblers or a Warp Disruption Field Generator (i.e. bubbles) involved. 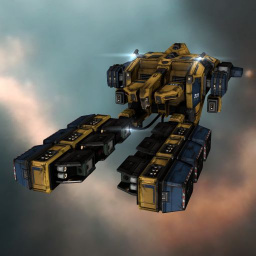 This makes the ship somewhat safer to travel in through lowsec, nullsec or even war target infested highsec, though definitely not invulnerable to gangs of gate campers which often have multiple tackles or who will blow up the ship in a single volley. This page has been accessed 683,648 times.